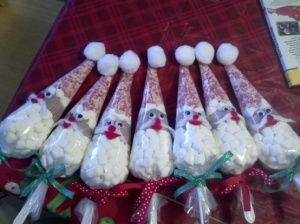 I just love these Santa bags for individual hot cocoa mixes. Are you making any Christmas gifts this year? I would love to share your ideas! Fill a clear cake decorating bags or cello bag with peppermint chips, hot chocolate mix & marshmallows. Insert a spoon dipped in chocolate for stirring then tie the bag with a ribbon. Glue a white pom pom, wiggle eyes, felt nose and mouth & a cotton mustache on the outside and voila! 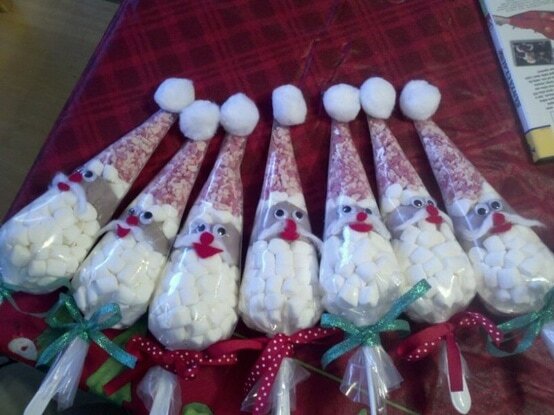 Individual Santa Hot Cocoa Bags! You may also want to check out the step by step instructions here; http://eggyolkdays.wordpress.com/2012/12/02/santa-hot-cocoa-gift/. She even lists some helpful tips that I would not have thought about. Are you on Pinterest too? Follow my pins here and I will follow you back!